The Weird family have always been a little, well, weird but when their grandmother announces she will die at 7:39 pm on April 20th, Angie discovers her and her siblings were cursed at birth. Grandmother Weird had meant them as blessings but each has ruined their lives. Kent will never lose a fight, Lucy will never get lost, Richard will always be safe, Abba will never lose hope and Angie will always forgive. If they are all present at her time of death, the curses will be lifted. Yet the Weirds aren’t a close-knit family and Angie must track them down and convince them. 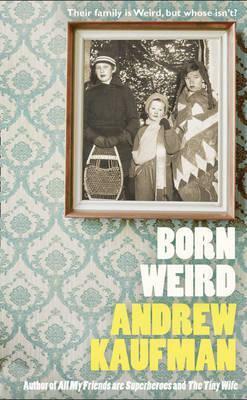 One word to describe Born Weird is weird but Andrew Kaufman’s writing is surreally charming. He manages to be both light-hearted and serious at the same time; there’s lots of amusing lines and passages but at the heart of it is the message that getting things wrong is part of life. They might be weird but their dynamics are that of many a large family, the interactions between siblings completely believable. I loved Rainytown, the imaginary town they made out of card and scraps as children and kept cropping up throughout the story. There’s a race against time across Canada and a lot of bad haircuts in this short but perfectly entertaining novel. Born Weird will be published tomorrow by The Friday Project in hardback and ebook formats (the Kindle edition is currently only £2.99). Thanks go to the publisher for providing a copy for review. I've just finished The Tiny Wife and this sounds like it has the same curious charm. Wonderfully surreal, I will keep an eye out for this.